When it comes to business continuity in law firms, it is a no brainer. Law firms are prime examples of businesses that simply cannot afford any amount of downtime. In a 2007 report, Pam Hill of the American Bar Association (ABA) wrote, “Downtime can have an almost immediate impact on the long-term financial viability” of a law firm, especially smaller practices. She continued, “The most important question to ask yourself is, if you couldn’t get into your office, what would you need to be able to work? Include people, records, vendors, data, applications, images, and so forth into the mix, and then think through how” that would impact the firm. The consequences themselves can be disastrous. A failure to adopt a dependable disaster recovery plan can expose a law firm to enormous risks: financial, legal and ethical. Let’s look at some example scenarios that illustrate why business continuity in law firms is so essential. 1) What would happen if the network went down? No, not just your Internet connection. Access to all your files and data. The immediate reaction to a brief system outage is usually, “What now?” Usually, you and your staff simply wait for it to be restored. But imagine that downtime lasts days or weeks, not just a few minutes. Think about the impact on productivity alone. What kind of losses would the law firm incur? 2) What if that data was actually gone? Emails, images, video, audio, client data, case files – everything. If everything you ever saved on a server or a local machine was permanently irretrievable, how would that impact the firm? How much would it ultimately cost? For most firms, the consequences would be devastating. 3) What if your files were compromised or stolen? Disasters come in all sizes. The major threats aren’t just office fires, floods and other natural disasters. Human error, malware and cyberattacks are extremely common threats that cause business law firms to lose access to their data. It’s imperative for firms to think beyond simply getting “back into the office” after a disaster. Disaster recovery requirements need to address whether technology will allow you to regain access to your invaluable data. 4) What if your failure to prepare for disaster affected your cases? So on top of the costly losses in productivity and data, unpreparedness can also result in costly litigation risks. 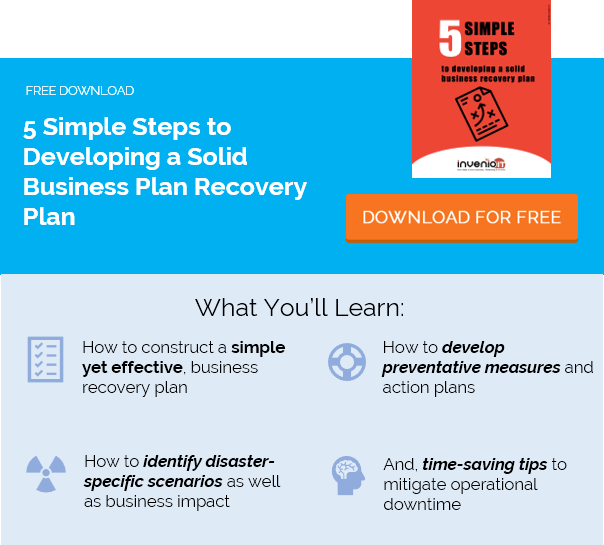 Each of the scenarios above illustrates a vital component of business continuity that law firms must adopt: dependable data backup and recovery. But keep in mind that the type of backup solution you choose is important. Many firms are relying on outdated technology that leaves them at risk. The ABA’s 2007 report found that, “In general, 80 percent of all [data] restores fail the first time due to corruption of data” using a common backup technology at the time.” Even when successful, full restores could take days or even weeks. Every law firm disaster recovery plan must incorporate newer, more dependable recovery data technology. Solutions from Datto, for example, can store backups securely both on-site and in the cloud for greater insurance. Data can be restored in minutes. Plus, backup integrity is checked constantly to ensure it can be restored without issue. By providing 360-degree protection against downtime, these solutions ensure your firm can keep operating after a disaster.